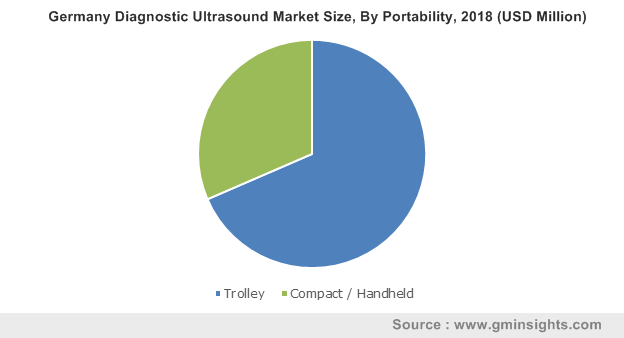 Diagnostic ultrasound market size was valued at USD 5.7 billion in 2018 and is expected to witness 3.8% CAGR from 2019 to 2025. Growing burden of chronic diseases worldwide coupled with rapidly growing geriatric population base will drive the market growth over the forecast period. Elderly population highly prone to diseases due to various structural and functional changes will positively impact business growth. 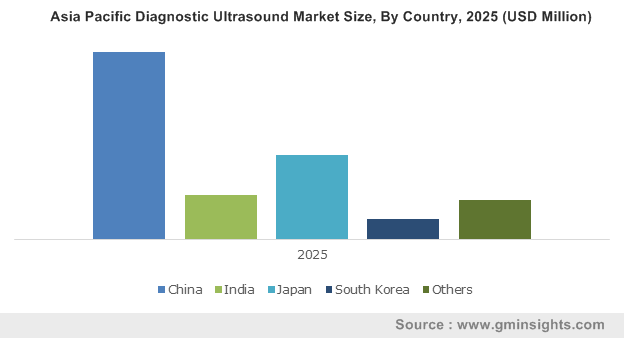 Furthermore, rising investments in improving healthcare facilities in developing economies will further positively impact the global diagnostic ultrasound industry growth. 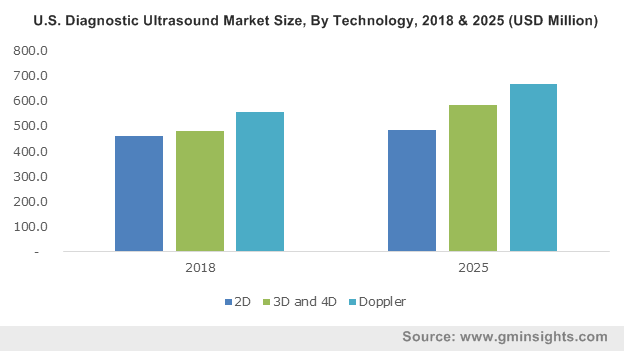 Increasing birth rates in countries such as Germany and Russia will propel business growth over the forecast years owing to extensive use of diagnostic ultrasound during pregnancy. Ability of the diagnostic ultrasounds to detect anomalies in baby’s position and actions inside the womb will further propel business growth in the foreseeable future. Moreover, rapid advances in ultrasound technology as well as systems will further spur the industry size. However, dearth of skilled professionals and lack of training may hamper diagnostic ultrasound business growth over the analysis period. Doppler technology segment held more than 33% of revenue share in 2018 and is anticipated to show similar growth trend over the forecast period. Doppler eliminates the need for injecting patients with contrasting dye thus increasing its adoption in numerous applications such as X-ray angiography. Furthermore, increasing use of doppler ultrasound for estimating blood flow and pressure will spur the segmental size. 3D and 4D technology segment accounted for significant revenue in 2018 and is estimated to witness 4.4% CAGR during the forthcoming years. Segment growth is attributable to wide adoption of 3D technology in detection of breast cancer. Benefits offered by 4D ultrasound including shorter duration for fetal heart screening/diagnosis, high volume data storage capability for expert review, screening, remote diagnosis and better identification of fetal anomalies will favor business growth. Trolley segment was valued over USD 4 billion in 2018 and is expected to show lucrative growth in the foreseeable future. The segment growth is attributable to reliance on trolley systems prior to introduction of compact or handheld systems. Advantages offered by trolley systems such as ease of usage, better image quality and built-in advanced features will augment business growth. Compact/handheld segment is estimated to witness fastest CAGR of 5.0% during the forecast timeframe. Ease of carrying smaller and lighter handheld systems in intensive care units, emergency rooms, operating rooms and around the premise will increase adoption of these systems over the forecast period. Cardiology segment accounted over USD 1 billion in 2018 and will show significant growth over the coming years. Increasing use of diagnostic ultrasound in cardiovascular studies coupled with rising burden of cardiovascular diseases will boost the industry size. Moreover, development in technology and potential benefits associated with the device to optimize cardiac diagnosis will further fuel the business growth. General imaging segment is anticipated to witness substantial CAGR of 3.8% by 2025 owing to increasing use of diagnostic ultrasound for examination of vascular, kidneys, abdominal, urology, gall bladder, pain management, liver, spleen and pancreas. Significant technological improvements over the last few decades, in equipment as well as development of diagnostic ultrasound systems will foster its adoption thereby driving the business growth. Hospitals segment dominated the global market with more than 44% revenue share in 2018 and will show similar trend over the analysis timeline. Rising usage of ultrasound as an integral part of diagnosis and follow-up of several diseases in hospital settings will accelerate the segmental growth in coming years. Maternity centers segment is projected to show robust CAGR of 3.7% during the forthcoming years. Growing access to ultrasound in maternity centers, rising availability of ultrasound services in developing countries and increasing emphasis on routine ultrasound during pregnancy will fuel industry growth. North America market was valued over 1.5 billion revenue in 2018 and is anticipated to show substantial growth during the forthcoming years. High growth is attributable to rising prevalence of chronic ailments coupled with awareness among people pertaining to early disease diagnosis. Availability of advanced healthcare facilities in the region will surge the demand for diagnostic ultrasound thereby escalating regional growth. Asia Pacific market accounted for considerable revenue in 2018 and is estimated to witness robust CAGR of 5.2% during the forecast period. Presence of large patient pool in the region will foster business growth. Rising disposable income in emerging economies such as India and growing awareness among people will further fuel regional industry growth. 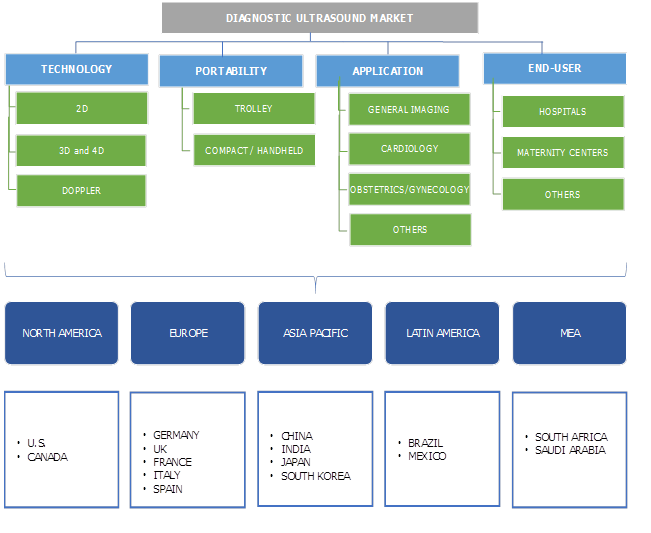 Some of the key industry players operational in the diagnostic ultrasound market includes Analogic, Arthrex, Chison, C.R. Bard, Esaote, FujiFilm, Fukuda Denshi, GE Healthcare, Hitachi, Kalamed, Koninklijke Philips, Mobisante, Promed, Samsung Electronics, Shenzhen Landwind Industry, Shenzhen Mindray Bio-Medical Electronics, Siemens Healthcare, Shantou Institute of Ultrasonic Instruments, SonoScape Medical, Sunway Medical, TELEMED Medical Systems, Toshiba Medical Systems, VINNO Technology (Suzhou) and Trice Medical. Industry players focus their efforts on implementing strategies such as merger, acquisition, partnerships as well as new product launch to sustain competition in the market. The history of ultrasound can be traced back to its introduction as a diagnostic tool for displaying normal pathology & anatomy during and after the second World War across various centers globally. Use of ultrasound as a means of generating images of the abdomen, pelvis and other small parts, was introduced at radiology meetings and in literature, in the early 1970s. Initial instrumentation involving A-mode and B-mode static imaging produced only still or static images. This technique was used for imaging the abdomen, pelvis as well as for evaluating the fetus during pregnancy. Later, introduction of real-time scanning in 1979, rendered radiologists, ability to perceive live images illustrating anatomy. Ultrasound signified a major advancement in diagnostic imaging by allowing the creation of cross-sectional images without the use of ionizing radiation. Advent of technology in diagnostic ultrasound systems has increased its adoption over the recent years. Growing demand for these systems to enhance diagnosis will accelerate diagnostic ultrasound industry growth during the forecast period.